Shopping for Nightmare Before Christmas Film Cells? Own a piece of Tim Burton's masterpiece The Nightmare Before Christmas! 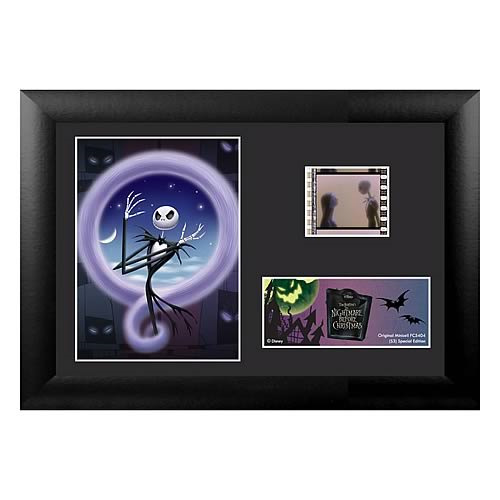 Features Jack Skellington, beautifully mounted and framed! A must-have collectible, direct from Halloweentown! Oh Halloweentown... This amazing film cell features a print and actual film cell from The Nightmare Before Christmas. It measures 7 1/2-inches wide x 5 1/2-inches tall. Perfect for displaying in your home or at the office, all the elements are framed in black wood and include a certificate of authenticity. Please note that the actual film cells vary from piece to piece as they are hand selected from reels of film. Every year in Halloweentown, the monsters come out on Halloween and perform a real scare. One Halloween, pumpkin king Jack Skellington becomes bored with this idea and saunters off into the woods. He soon discovers a clearing of trees that have particular doors to match the various holidays. Jack is entranced by the Christmas Tree door, and he enters the world of Christmastown. He is fascinated by the idea of Christmas and is determined to share it with his fellow citizens of Halloween town.